What happens to a user whose comment was flagged as rude (e.g. using f-words to describe another user)? Do they get any sort of ban, or reputation loss (like with spam flags)? Additionally, is there any difference if the flag was custom, instead of "rude or offensive"? "rude or offensive" flags on comments don't have the sort of immediate effects that similar flags do on posts. They don't carry an automatic reputation penalty or work to block the user in any way. The only automated mechanism is immediate deletion by the system if a flagged comment has certain choice words in it. However, moderators can take action on these depending on the severity of the flagged content. We might warn a user in comments, warn them in a mod message, suspend, or even feed their account into the anti-trolling system, as circumstances dictate. A lot of factors play into this, such as how insulting the content was, whether the user has any redeeming value as a contributor, patterns of behavior, etc. Every situation is evaluated on its own. Comment flags carry no automatic penalties. Low threshold deletion applies to comments which get flagged and match certain things, so a single flag can sometimes be enough to delete a comment if it's particularly obviously bad. Often the worst comments rapidly get the 3 flags needed to kill them long before a moderator comes along. A custom comment flag will usually get seen by a moderator. (A custom flag on the post the comment is attached to will definitely get seen and lets you explain in more detail). 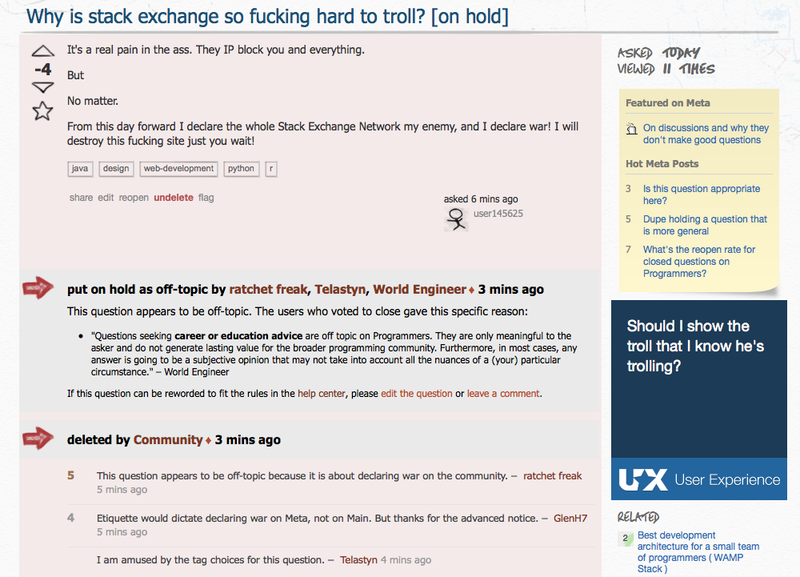 As such moderators are likely to read other comments written by the same user and check for other flags/history. I have a mental threshold for comments, above which I pretty much always have a peek around. That in turn increases the likelihood of a ban/message if the issue is more serious behaviour problems. For either kind of flag when I view it temporary locking is also an option, usually I'll only do that if the comments are more than just a single one and still on-going. In general when I’m reviewing flagged comments that include attacks on users (based on intent rather than specific words) I'm significantly less tolerant of new users that have offered little/nothing positive. What would the consequence for insulting someone be? What happens to flagged users? What are the typical punishments for having a post found to be rude/abusive or spam? Comment deleted; what should I have done? Do I have right of reply? What to do when moderators don't care about rude users?